Super Smash Bros Ultimate Full Character Roster, plus guides on every fighter in the game, covering changes, moves and alternate outfits. Super Smash Bros Ultimate is by far the biggest game in the series so far. There are over 1000 audio tracks, 74 fighters, a brand new single-player mode, and more to sink your teeth into. Every single character from previous games is making a return, though there have been slight changes to almost all of them. To help you get reacquainted with your favorite fighter, and to help inform you in picking a new one if you’re looking, we’ve put together character guides for each fighter in Super Smash Bros Ultimate. In this Super Smash Bros. Ultimate Roy Guide, we’ll be taking a look at Roy. We’ll detail the changes that have been made since his last appearance, take a look at his Final Smash, and also some of the Alternate Outfits that you can select. For more on Super Smash Bros Ultimate, you can head over to our Smash Bros Ultimate Characters Guide. It’s got an ever-growing list of guides on every character in the game. We add them in regularly, so it’s definitely worth checking back to see if we’ve covered your favorite fighter yet. Fire Emblem hero Roy is back for Super Smash Bros Ultimate, bringing a number of changes with him. He’s still a fairly light and quick fighter, but thanks to buffs to his special moves, he’s been given some extra power. Let’s take a look at how Roy plays in Super Smash Bros Ultimate. All Fire Emblem characters have Critical Hit as their Final Smash, and the same is true with Ryo. Elsewhere in the table below, you can find all four additional moves for Roy. Playing the World of Light single-player mode. Completing Classic Mode with a character. Playing the ‘Challenger Approaches’ fights that appear regularly, you will need to win them. Quit to the home screen and Restart the game. Create a match with a custom rule set. Make sure the match is 1 minute long, or 1 stock if you'd prefer. After finishing the match (you can win or lose) you will offered a new Challenger Fight. For more info on unlocking characters using the modes listed above, head over to our Super Smash Bros Ultimate Character Unlock Guide . 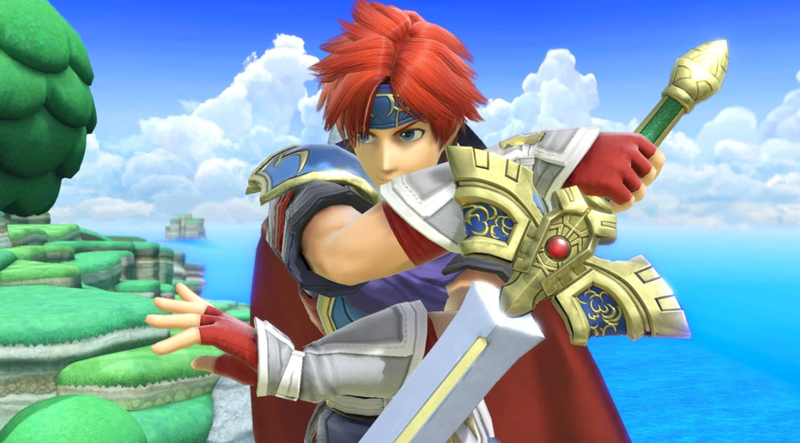 Several of Roy’s animations have been changed including victory poses, jumpsquat, forward throw, and forward smash. Roy now has flames added to many of his attacks. This includes his Critical Hit, which sets the stage ablaze. Up aerial knocks the enemy higher. English voice clips have been added to certain moves. 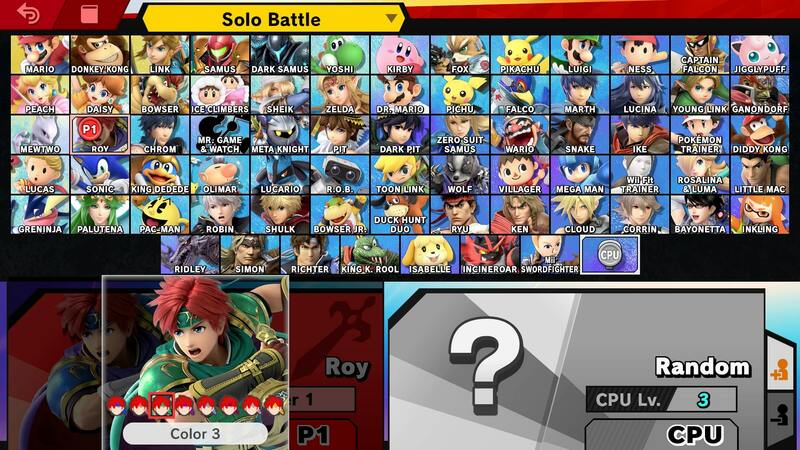 As in SSB4, Roy has a number of variants that can be selected to make him stand out from other players. These are simple color palette swaps so nothing as drastic as a new outfit or skin, but they are fun to try out anyway. There are orange, green. pink/orange, blue, brown, grey and yellow versions of Roy’s main design. 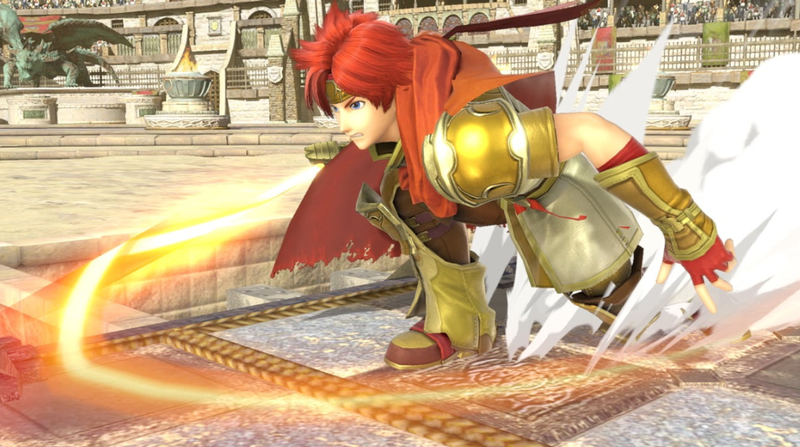 Much like other Fire Emblem characters in Ultimate, Roy uses Critical Hit as his Final Smash. It is slightly different to that of Marth and Lucina, with a shorter range and fire effects. It is a little more reliable and easy to execute, though you need to be close to your opponent to guarantee a hit. You can check out Roy’s Critical Hit Final Smash in the trailer embedded above. That’s everything on Roy in Super Smash Bros Ultimate. To check out some more details about the upcoming fighting game, head over to our Super Smash Bros Ultimate Guides Hub. It’s got trailers, a look at the new amiibo, some stages and more. Hey! I recognize this song.